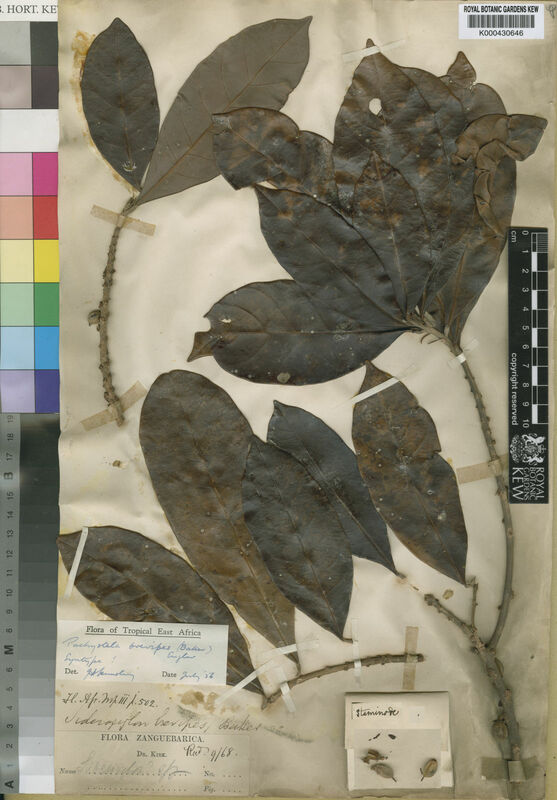 Seed solitary, ellipsoid and slightly flattened; testa shiny brown with prominent pale rough lateral scar covering two-thirds or more of surface area; endosperm absent; cotyledons fleshy, plano-convex; radicle basal. Leaves moderately coriaceous, glabrous; lateral nerves fairly distant, curving towards apex. Flowers fascicled in axils of current and fallen leaves, pedicellate. Calyx of 5 sepals, united up to 1/2 their length. Corolla lobes equalling or longer than tube. Stamens inserted at mouth of tube; filaments short, anthers erect, extrorse. Staminodes present, very small, ± oblong, dentate at apex. Ovary ovoid or narrowly conical, pilose with short style. Fruit a fleshy red 1·seeded berry with calyx persisting at base. Seed ellipsoid, with wide scar extending the length of the seed; endosperm absent, cotyledons thick and fleshy. Stipules present, persistent or caducous. Leaves moderately coriaceous, lateral nerves fairly conspicuous, distant, curving towards leaf apex. Flowers 5–merous, fascicled or solitary, borne in axils of current and fallen leaves, long–pedicellate or sessile. Calyx of small sepals ± free to the base. Corolla much exceeding calyx, lobes longer or shorter than tube. Stamens inserted at level of base of corolla lobes, with long slender filaments or subsessile; anthers extrorse or introrse. Ovary ovoid, densely long–pilose, with slender style. Seed compressed–ellipsoid; scar long, occupying lateral face; endosperm absent, cotyledons fleshy. Seed solitary, ± ellipsoid; testa thin and brittle; scar lateral; endosperm scanty or absent; cotyledons fleshy, plano-convex; radicle basal. Leaves coriaceous; lateral nerves fairly distant, curving towards leaf apex; tertiary venation inconspicuous. Flowers 5–merous, fascicled in axils of current and fallen leaves, sessile or pedicellate. Calyx segments shortly united at the base. Corolla lobes longer than tube. Stamens inserted at level of base of corolla lobes, with long flexuous filaments; anthers extrorse, included in to considerably exserted from corolla. Staminodes absent or present and then often irregular in shape and number. Ovary ± ovoid, pilose; style long, cylindrical. Seed compressed–ellipsoid, the scar covering more than half its surface; endosperm absent, cotyledons fleshy. Seed solitary, ovoid or ellipsoid; testa with prominent scar covering at least half of surface area; endosperm absent; cotyledons fleshy, plano-convex; radicle basal. 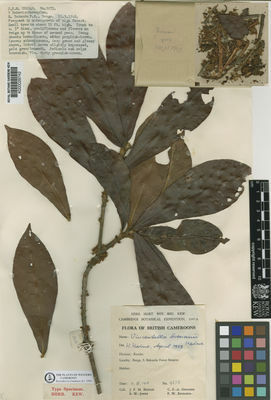 Synsepalum aubrevillei (Pellegr.) Aubrév. & Pellegr. Synsepalum batesii (A.Chev.) Aubrév. & Pellegr. Synsepalum carrieanum (Dubard) Pierre ex ined. Synsepalum gabonense (Aubrév. & Pellegr.) T.D.Penn. 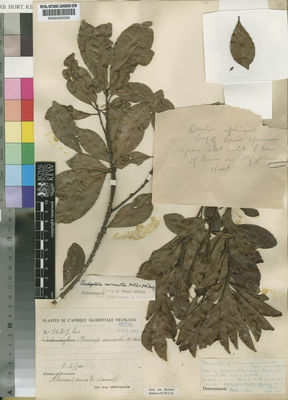 Synsepalum lastoursvillense (Aubrév. & Pellegr.) ined. Synsepalum letestui Aubrév. & Pellegr. 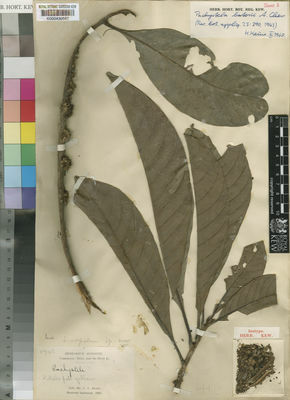 Synsepalum ogouense (Aubrév. & Pellegr.) ined. Synsepalum ovatostipulatum (De Wild.) ined. 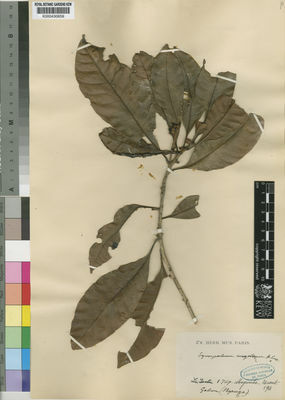 Synsepalum oyemense (Aubrév. & Pellegr.) ined. Synsepalum pobeguinianum (Dubard) Aké Assi & L.Gaut. Synsepalum seretii (De Wild.) T.D.Penn. 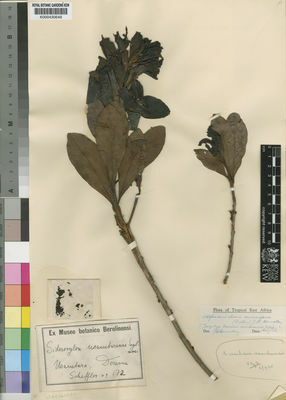 Synsepalum tomentosum (Aubrév. & Pellegr.) ined. Synsepalum tsounkpe Aubrév. & Pellegr. Synsepalum zenkeri Aubrév. & Pellegr. Chev. in Rev. Bot. Appliq. 23: 291 (1943).